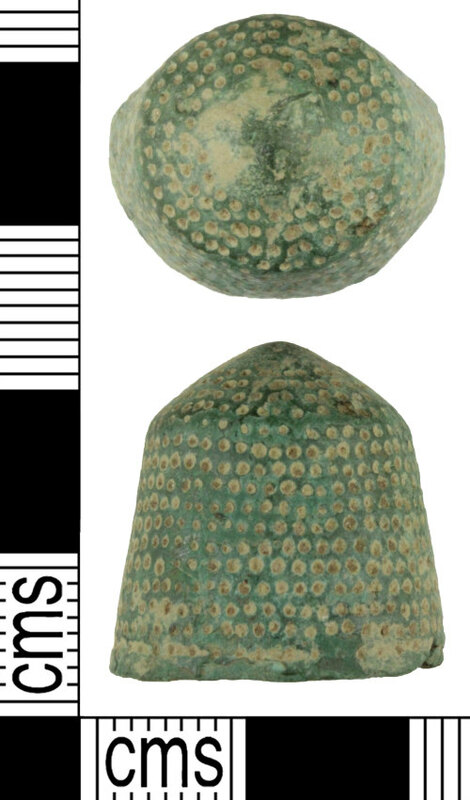 A copper-alloy beehive thimble of cast construction dating to the medieval to early post-medieval periods (AD c. 1400-1600). The thimble is domed with slightly flared sides and a rounded 'tonsure' top. The drilled circular pits begin bordering the 'tonsure' top and continue in a continuous spiral to the base in a regular fashion. Above the base is a plain rim and the sides of the thimble taper towards the dome. The thimble measures 15.7 mm in height, 18.1 mm in diameter, the walls are 0.8 mm thick and it weighs 3.68 grams. The bare circular patch on top of the thimble, or 'tonsure', indicates a relatively early date; similar early thimbles are often dated to the 15th or 16th centuries, cf. Holmes (1988, 1).